In 1974, Delores bred Telltale Victoria to CH Salilyn’s Aristocrat, producing another one of her favorite dogs, CH Tellale Author. Lumpy, as he is affectionately known, was quite a character. He had a particularly bad case of Juvenile Pyodema with islands of swollen glands all over his body. This went on for about six months, and everyone began to refer to him as the “lumpy puppy.” Because he looked so pathetic, he was showered with extra attention and affection. Nobody seemed to want such a pitiful looking puppy, and so Delores kept him. One day when Delores went off to work, a local springer breeder came to the house to take care of the dogs. Upon Delores’s return, she noticed this handsome young dog playing with her other dogs. To her amazement, it was her “lumpy puppy,” all done up in his new trim. Author’s turf was the specialty ring, where he earned 23 specialty BOB’s. He won BOB at the Eastern specialty in 1977, ’79, and 82, retiring that show’s Wakefield Black Knight Memorial Trophy. 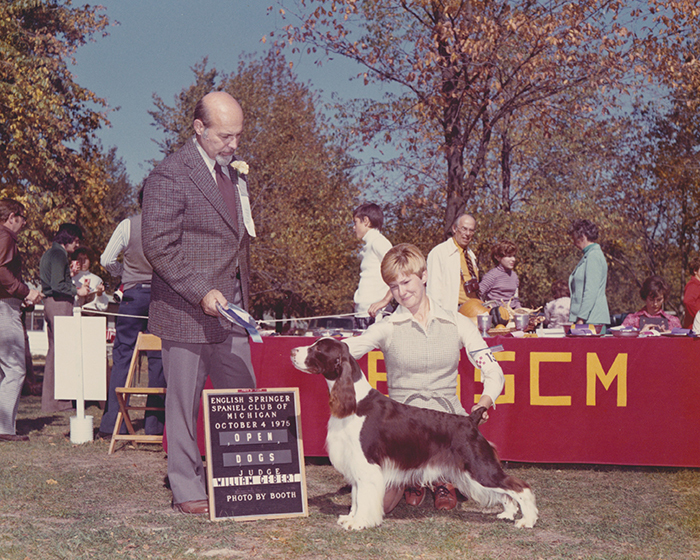 He was also the first dog to win the Michigan Fall Specialty three times in 1977, 78, and 79. He was twice awarded BOB at Westminster, followed by a Group II in 1980, and won the coveted Santa Barbara KC sporting group. Author was also Delores’s first national specialty winner. She had entered him in the veteran class at the 1982 national. Karen Miller won the class and then handed him over to Delores since she was going to be showing her own dog. Delores took Lumpy into the ring where they won BOB! 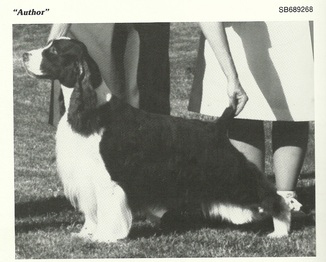 In addition to being a wonderful show dog, Author was also a Parent Club Runner Up Show Sire in 1977, ‘83, and ’84, and in 1988 he was ESSFTA Show Sire. He has produced over 40 champions, 6 Best in Show sons, a Best in Show daughter, numerous group winning progeny, 23 specialty winning get, and was 3 times sire of the ESSFTA Winner’s Dog. His progeny all represent his characteristics well, with balanced, sturdy, compact bodies which produce effortless gait. Perhaps his greatest legacy to his get shall be his outstanding temperament. In 1984, he was awarded the Producer of Distinction Certificate (the Schlintz System).